The Search Marketing Expo (SMX) West conference was a blast, and now I’m trying to recover and catch up on the things I missed at work. It was great seeing a bunch of familiar faces, and I met quite a few new folks as well. One of my favorite activities was the “Lunch with a Google Engineer” tables at lunch. For all three days of the conference, we had two tables at lunch, and each table had 1-2 Googlers to chat with conference attendees about anything webmaster-related. It was a great way to connect with new people. (My cat Ozzie volunteered to be in the photo to provide a sense of scale.) Check out the quiz questions to see how you do. At SMX, I did a Whiteboard Friday interview with Rand. It’s an unusual interview because we talk about more personal stuff, although we get into a few webspam specifics toward the end. If you want pure information, check out this video interview that Adam Lasnik did at SES London a couple weeks ago. I also really enjoyed this interview that Kevin Marks did with Caroline McCarthy about OpenSocial, OpenID, etc. I’m really happy that Google reaches out to webmasters in many languages, from our German webmaster blog or our Chinese webmaster blog to our webmaster discussion groups in Hebrew, Russian, and many, many languages in between. I’m proud to work with such a great group of colleagues in webspam and search quality. Google can still continue to ramp up our international communication with webmasters, but when you compare to even a couple years ago, we’ve really come a long way. For all three days of the conference, we had two tables, and each table had 1-2 Googlers to chat with conference attendees about anything webmaster-related. It was a great way to connect with new people. It means nothing if none of the Webmasters care enough to blog or do a podcast about those conversations. As had been said many times before – those chats only help a few then most of the info fades away in memory. By blogging or doing a podcast, the info lives on for years and will help THOUSANDS around the world who can not afford or do not have the luxury of visiting conferences. Google is now using the Webmasters tools site to convince members to report paid links. What will happen to the buyers and sellers? This is not an ethical thing to do! Remove the Sponsor Links from above the organic SERPs before criticizing others for also trying to thrive on the competitive Web. Matt, you really should put on some boxer at the very least before taking a photo of a shiny trophy. Google Blogsearch often presents me backlinks to that blog… why? go figure. I don’t mind because is an excellent blog but that would be an interesting puzzle for the blog search team. Btw, Pedro does not write much nowadays but he keeps his blog at http://www.egostrip.com and I’d personally recommend it to any portuguese speaking webmasters reading your blog. I am consistently very grateful to Google for giving us the info that you do and helping to demystify the rumors and give the straight information. I was reviewing the word camp info this weekend and how valuable it has been. Congratulations on the win. The Googlers I have met have all been extremely bright, positive and helpful people. Ozzie does appear to look a little shocked. 1. Ozzie knows something about you we don’t and he is surprised you won? 2. Ozzie can’t believe what you are wearing when you are taking the picture? 3. Ozzie is hoping you won’t look over in the corner and discover the little gift he left you in the corner on the carpet? Even IF they do, the fact are, statements are misquoted, taken out of context and become nothing more that Chinese whispers. In Year 2008 and with SE being at the forefront of technology, there MUST be video. The interview was very interesting Matt, I didn’t know that whole you joining Google story. I am happy we had another cat post but he does look very angry, did you force him to stay still? Matt, great meeting up with you again at SMX West, and swapping cat stories (“Hermie the Hermaphrodite”). I give incredible props to anyone claiming to have the Daily Searchcast in their car stereo. Great job dealing with the “boo crew” and I hope to run into you again soon. Pedro Dias is a great guy and the interview was great. You are lucky having this guy at your side. Eric, it was very nice talking to you too. And now you can confirm that I do listen to the SearchCast in my car. I guess there’s a reason I know some search trivia/facts — I listen to that instead of the radio. I’m sure the cat picture posts are read far more than any of the others. Matt congrats on the win. I checked out the questions, some tough ones for sure. lol, nice pic. Congrats on winning! You have a 3 foot tall cat!? Congrats on winning the trophy. Also, I just wanted to say thank you for sharing as much as you do with the Webmaster and SEO community. Obviously, you cannot divulge information at the rate many want you too, but that’s OK by me. I appreciate any tidbit you can muster up. To the whiners out there… Shhhhhhhhhhhhhh! Don’t give Matt a reason to hate providing us with insight and information, even if it’s not immediately pertinent or beneficial for yourself. Don’t forget about the Michael Gray bride incident in the SEO & Blogging session! OK, so it took a really long time for me to edit and post it, but the Pubcon interview you gave me is finally online. Googlers have been posting recaps of the conferences we attend, and we’ll likely post something from SMX West this month. 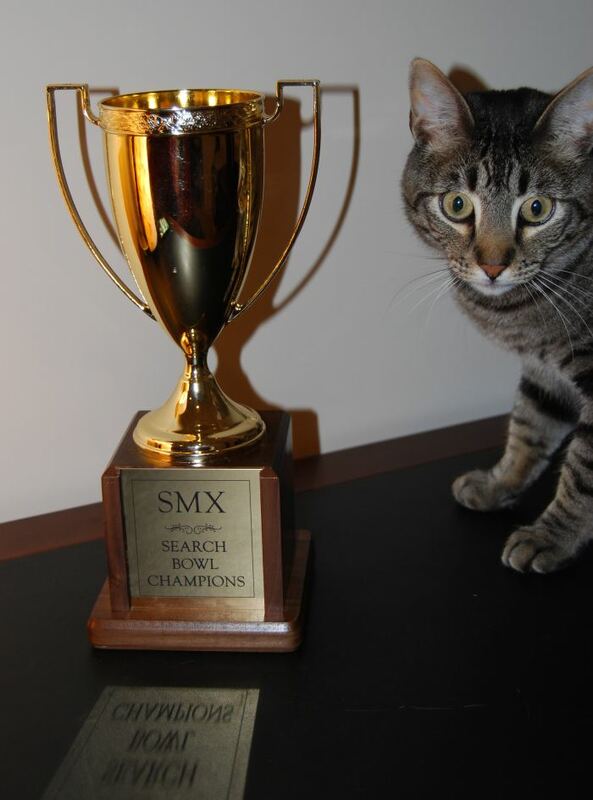 Nice looking cat, SMX was a blast, well good for you, glad you had a good time. When you were mentioning Google being all international and such, I was feeling left out with no mention of bridging the language barrier to Google Australia. I mean, ebay.com.au now says “G’day Judd” when I log in. Instead of “I’m feeling lucky” couldn’t Google Australia say something like, “Gizza wooperangadoo” or some such? HAHHAHAAaaa… I kill me. Your cat, like most cats, is psychotic. I hope it sleeps in another room. Matt, do you know any SMX in China? if so, i will for sure to take part in. When you get a chance to check our SEO software, please let me know. As I said, we are more interested in working with the search engines than fighting with them with black hat methods. PS: Did you get to check that website I mentioned that was potentially penalized? Although video would be an excellent way for the lucky few webmasters to share what they are being told, it’s a great opportunity for them the learn and they aren’t obligated to do us any favors. I guess if we want to knowledge bad enough, we’ll get off our tooshies and attend the next event. No such “seo software” will replace the human brain or common sense. Matt, you and other interested Googlers should also come on the tour. Lot’s of fun, and since this is the Olympic year in China, it’s a once in a lifetime opportunity. But it does fill the space created by a lack of either (or both) quite nicely. Congratulations, where can i find out who won in 2010?